From August until late October I’ve had the blessing and privilege of crisscrossing the United States visiting with family and ministry partners while on furlough. It’s been an absolute joy to be reunited with so many special people and to see God’s provision through new prayer partners and about half of the needed financial support being raised so far. However, I am becoming very travel weary due to moving through 8 different states all across America. In addition, I’m currently not feeling well. Please pray for continued traveling mercies, and strength so that I can return healthy to the Netherlands in November. 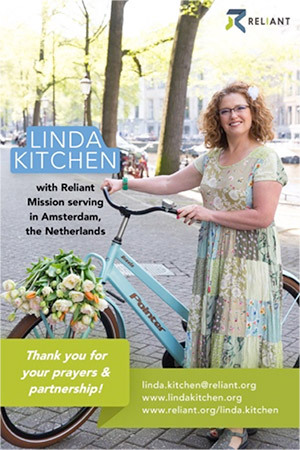 Photo to the right is the new prayer card that I’ve been handing out to those who desire to be praying for the work God is doing through Reliant Mission in Amsterdam. All regular giving donors will be receiving one, either hand delivered during our appointment or in the mail if we’ve not been able to schedule a time together. Thanks for your prayers, which is a vital part of this ministry! Over the past 5 years Amsterdam50 church had observed what seemed to be a lack of effectiveness in raising up disciples who were making disciples. Therefore, after prayerful consideration Amsterdam50 has closed in order to start something new. In mid-September there was a celebration service to rejoice in all God had done in hundreds of people’s lives over the 13 ½ years of the initial church plant in Amsterdam. As a result of the church closing it’s doors, a number of people have expressed an interest in continuing to join together to actively share their faith and live out their calling. The plan is to pursue this in smaller gatherings while carrying out the mission / vision. We will be meeting together in people’s homes as “house churches”, like what we read about in Acts 2:42-47. I’m excited to join that community when I return in November. Clearly this is a big change and something quite different than gathering in larger numbers in one place on a Sunday, but we’re trusting that the Lord will lead us as we unify in reaching out to people in the city who have yet to meet the Living God. Please pray for God’s leading and direction for the new house church ministry in Amsterdam.